The breathtaking views from this 11th floor vacation rental will make you say "Mer Sea"! Spend some time in Navarre Towers 1106. A spacious 2 bedroom, 2 bathroom vacation rental condo, with magnificent views of the Gulf of Mexico from the living room and master bedroom. There is room for up to 8 guests, with a King in the master suite, 2 Queen beds in the guest bedroom, and a sleeper sofa in the living room. Enjoy a fully furnished Kitchen, full size washer and dryer, and all the comforts of home during your time on the emerald coast. 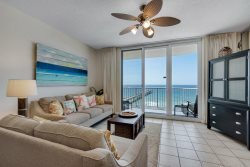 Luxuriate in the quiet beach life here on beautiful Navarre Beach, where you will delight in the sugar white sands and the exquisite blue green waters of the Gulf of Mexico. Grant yourself a little "Mer-Sea" and book this amazing vacation rental today! The staff is knowledgeable and friendly. Check in/check out was extremely easy and convenient. Agency stays in contact via email prior to and after booking, during check-in and after check-out. Wonderful location and NT is my favorite place. We have been coming to Navarre for over 25 years and have no plans to spend our yearly vacation elsewhere. Very glad we booked through your agency as the experience was good. We liked getting information ahead of time. The 24-hour follow up email was nice. Check-in was easy and the person was very friendly, it was great to only have codes to remember, no keys to keep up with, and the property was great. We would have used a hot tub every day because we came a week to early and had cold weather! Everyone was friendly, helpful, and polite! Highly recommend. The condo was amazing. Large, clean, and welcoming. Linens we great and fresh. Can't wait to go again. Will stay in same unit. Wonderful! Will stay next year! the team was very helpfull at check-in, and when we had a problem with the vcr, helped us get it going. The property was very nice and we will definitely stay there again next year! Everyone we encountered was friendly and helpful. We had a very relaxing stay with beautiful weather, a beautiful view of the ocean from our very nice condo! Enjoyed the location and the spectacular views of the gulf of Mexico!! Overall it was a good experience. Not right in Pensacola but close enough. Loved the location on the beach. The condo is beautiful and the weather was amazing.